Charlie’s Steak House is many things. There’s the menu, or lack thereof, the history, and then, there’re the anecdotes. It’s an old school New Orleans restaurant of the neighborhood variety. It’s a tad “Goodfellas”, in the best way; its Italian origins are everywhere. 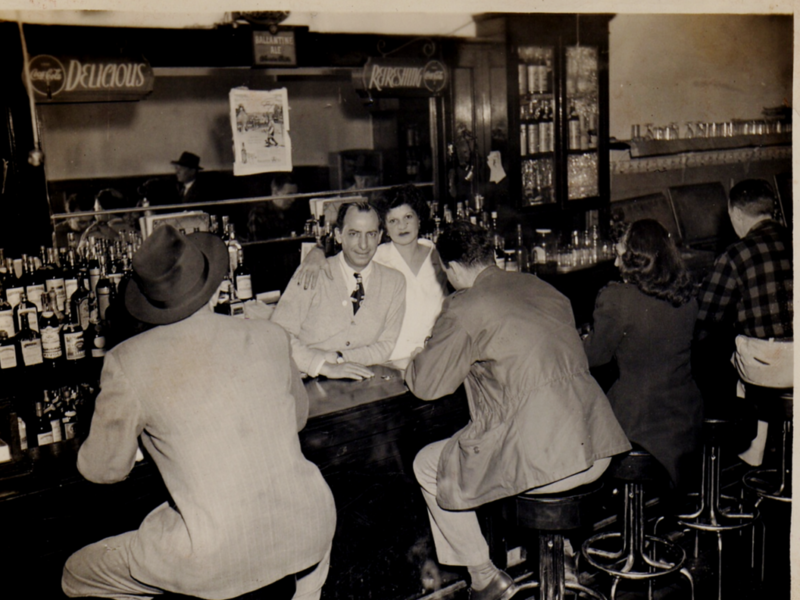 It’s a place where local’s grandparents drank highballs and chain smoked between courses. Of course, it’s not an Italian restaurant; it’s a Steak House. The Original New Orleans Steak House. But, somehow, it’s easy to imagine Sinatra at the back table running the place. However, he’d of had a run for his money, as locals know it was the old Italian waiters who ran the place. “Whatcha hav’in?” was not only the classic inquiry, but it was also a challenge. Nothing was or is in writing, and the waiters still run the show. The original, verbal menu was T-Bone steak, two sizes or a Filet. T-Bones were for men, a 32 ounce, a 26 ounce. Filets were for the dames. If you ordered the wrong steak for your weight or gender, you were told, “No!”. If you ordered your steak well done, waiter Pietro’s leather shoe might arrive on your tablecloth, “Like shoe? NO!” Ladies were not allowed to order Potatoes Au Gratin, “Too big for you!”, you could try, but it wouldn’t arrive. Anecdotes fly from every corner of the room—expect to hear several. Charlie’s is the place where Roberto Duran broke his fast after his Sugar-Ray Leonard, “Namaste”, fight in 1980. After leaving the scales, Duran inhaled two 32-ounce T-Bones and a gallon of orange juice. Not much has changed since the Petrossi’s, an Italian immigrant family, brought their restaurant savvy to America. Their passage log via Italian ocean liner, Duca D’ Aosta, hangs proudly on the wall, as do images of their island birthplace of Ustica, Sicily. Pietro, of waiter fame, may have worked at Charlie’s for over forty years, but when he retired, he went back to the old country. 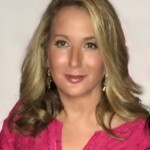 The new owners are Matthew and Gene Dwyer, who purchased and restored the lower dining room after Katrina. The upper dining room remains a time capsule. Recipes remain original and the menu hasn’t changed much, but the kitchen has – a little. Gone are the days of Miss Rhoda and Miss Agatha and their three pots. There is also a Tuna Steak, and no longer will a waiter crossly drag you outside, point at the Steak House sign, exclaiming, “No fish!”Actually, the present service is lovely and attentive, but expect to hear your share of lore. Thick Ribeyes and NY Strips have joined the T-Bones at Charlie’s, and the Filet is no longer gender-specific. 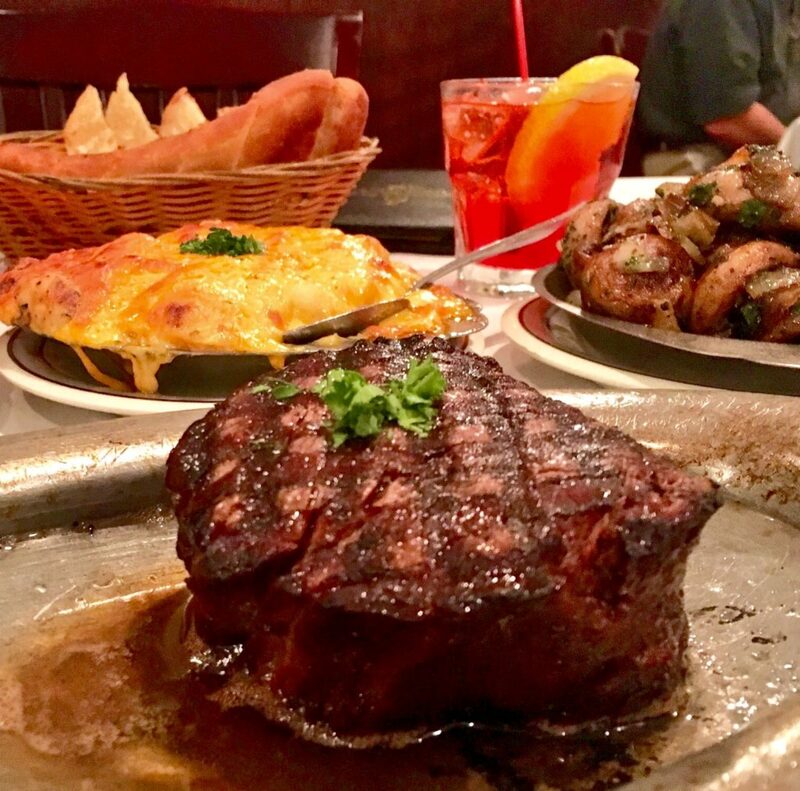 The steaks still arrive sizzling in butter on the original metal chargers, a serving concept originated by founder Charlie Petrossi. 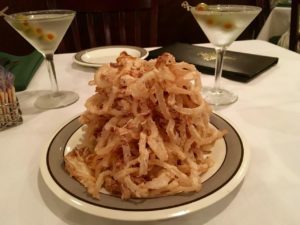 The iceberg salad wedge is also said by many to have originated at Charlie’s Steak House and their three signature dressings have not changed. The Blue Cheese Dressing is worth the trip and not for the faint of heart. You get Blue Cheese, Thousand Island, or Italian, don’t ask for anything else. The famous Tower of Onion Rings arrives first, it’s tradition. Follow the plan, and save a few to top your Iceberg Wedge. Then Steak arrives next, then the Sides – family style. The Cheddary Potatoes Au Gratin is my favorite, followed closely by the Colossal Lump Crab Meat Au Gratin. 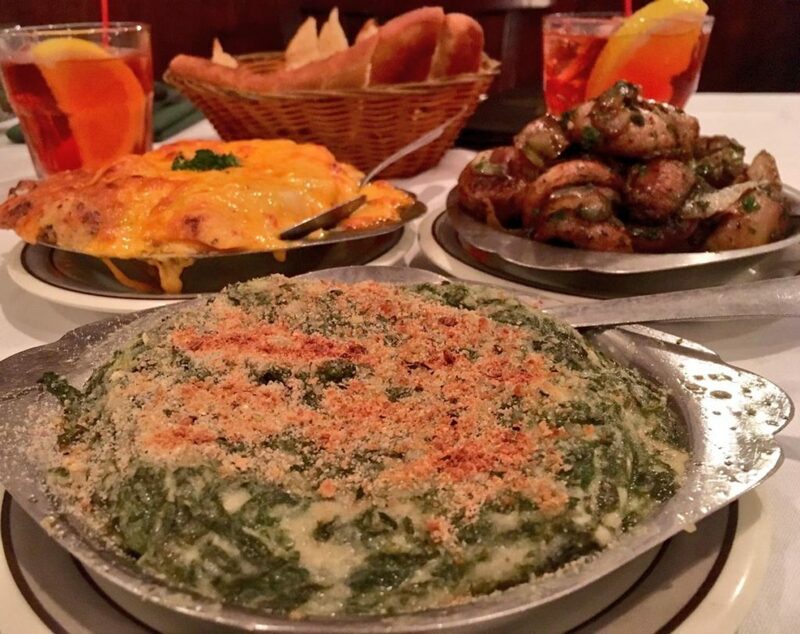 Go all out and order the Creamed Spinach and the Mushrooms Bordelaise too. The fresh Garlic Bread is baked daily in-house using Nola Tap Room’s Brown Ale. The restaurant’s Italian roots come back into play when it’s time for desert. Old school New Orleans’ favorite, Sicilian Angelo Brocato’s, provides desert at Charlie’s. The selections are the originals Brocato studied in 19th century, Palermo. Chose between Spumoni, Pistachio, and Torroncino, a vanilla-based gelato with cinnamon and ground almonds. I had no choice but to order the Spumoni. It was a childhood treat my father frequently brought home as an after dinner surprise. All in all, it was a feast, a dinner of the Huey Long or Don Draper variety: no craft cocktails, no gluten-free, no locally sourced, farm-to-table, or artisan mentions allowed. 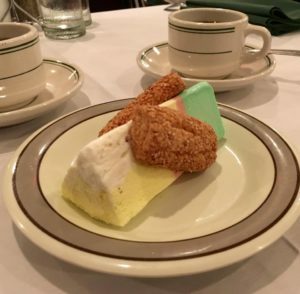 Capping off this meal of highballs, onion rings, blue cheese lettuce wedges, steaks, crab and potatoes au gratin, good coffee, a wedge of Spumoni, and Biscotti is more than nostalgia, it’s New Orleans. The Coolinary menu of five courses for $39 is available at Charlie’s Steak House through September. Reservations are recommended. Tuesday, Wednesday, Thursday 5:00 p.m. – 9:00 p.m.
My mouth was watering by the time I finished reading this. Kristine caught the essence of what made Charlie’s special. My father said that was a favorite of his during the oil boom days. More deals were closed after a Charlie’s meal than anywhere else. Glad to see the legacy lives on & more memories will be made there. Charlie’s has special memories for so many New Orleanians. Thank You!